This replica Roman gladius is an ideal piece for collectors, reenactors, or for costumes. 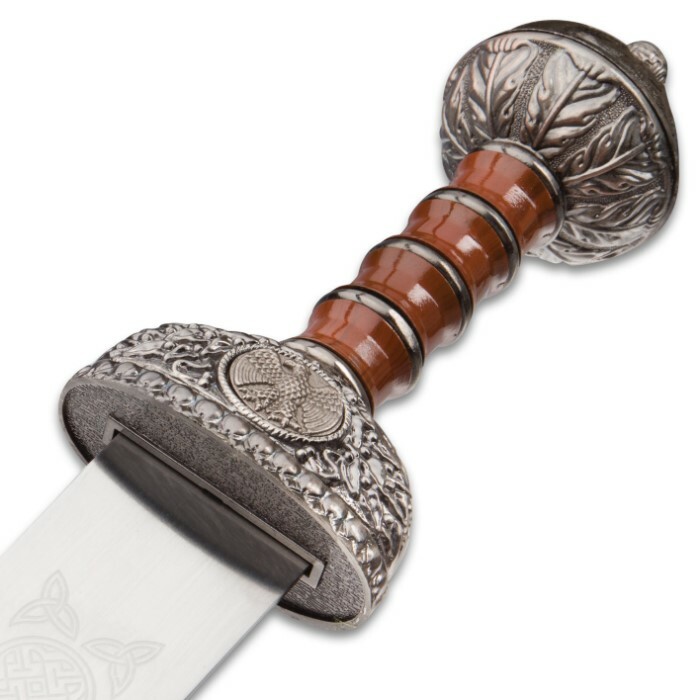 This sword features a 440 stainless steel 22" pattern blade with a detailed knot work design etched on the blade. 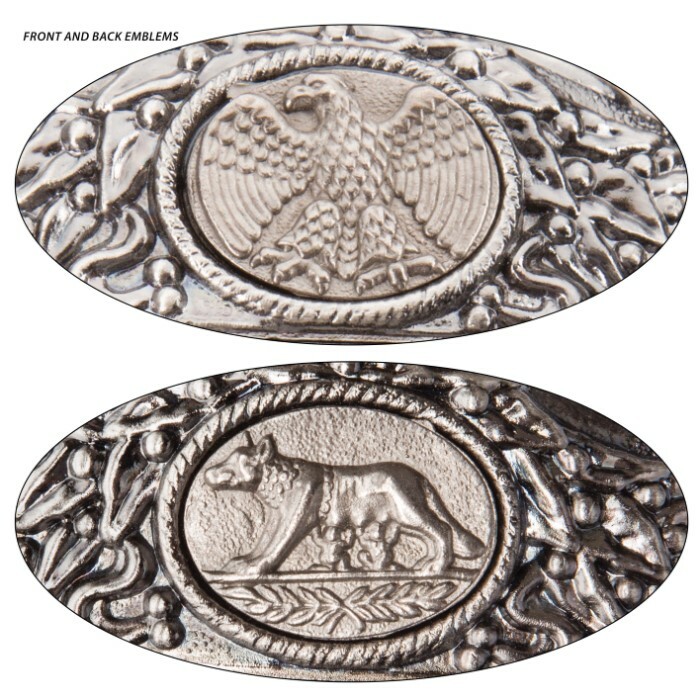 The authentically designed handle offers a cast metal guard and pommel and faux wood grip. 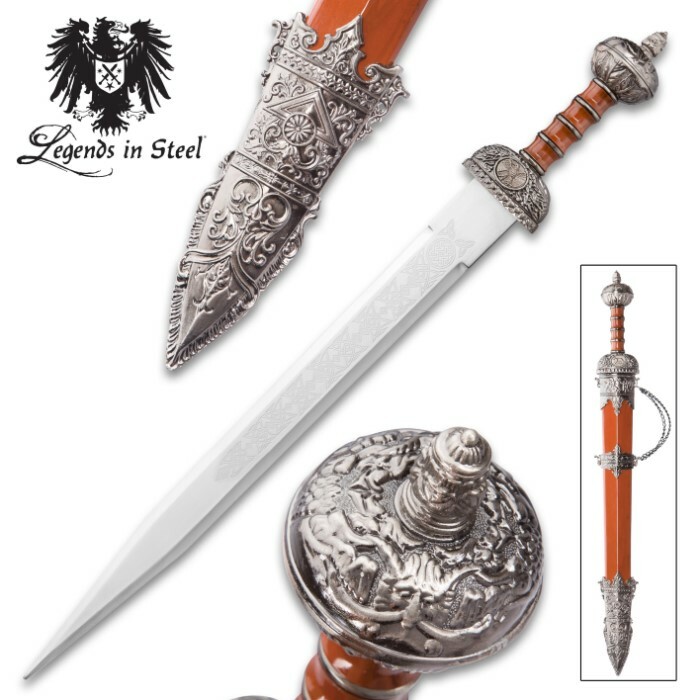 The metal scabbard offers a wood grain finish, hanging chain, and highly detailed cast metal furnishings. This historical sword measures 30" overall. I ordered this because the picture on the website looked great. Once I received this the scabbard which i assumed to be wood was plastic and just solid brown, not even painted to resemble wood. i was severely disappointed, and the sword it self was dull. Fabulous sword. I teach high school Western Civilization and my students love it when I bring in "hands on" stuff, like swords, shields, pikes, helmets, etc. This sword looks great, has a nice feel to it and really captures the eye. Kennesaw has done it again! I have yet to be disappointed with any purchase. Kennesaw allows me to purchase historical swords at a price I can live with. No, my school doesn't reimburse me for military "show & tell"! Buy with confidence! It's a good sword and I think it looks pretty awesome. I love Roman stuff, so that's why I got it. My only complaints are: 1. The wood is actually plastic 2. The handle wobbles(it holds but it feels unsteady) 3. It doesn't come with a wall mount. It's only forty bucks so it's totally worth it. Apart from these defects, it's a great sword and I wasn't disappointed. My daughter wanted her own sword for her wall, as the rest of the family already has. She could have chosen anything that she wanted. We went through all the websites of all the major and some minor players that I am sure you all know. I tried to sway her to carbon steel, but as she is studying roman history she wanted this Gladius due to the look. It took a bit of time to get here but the suspense was fun for me. When it arrived she was very happy, it was just what she wanted. Now for my assessment. It was pretty. 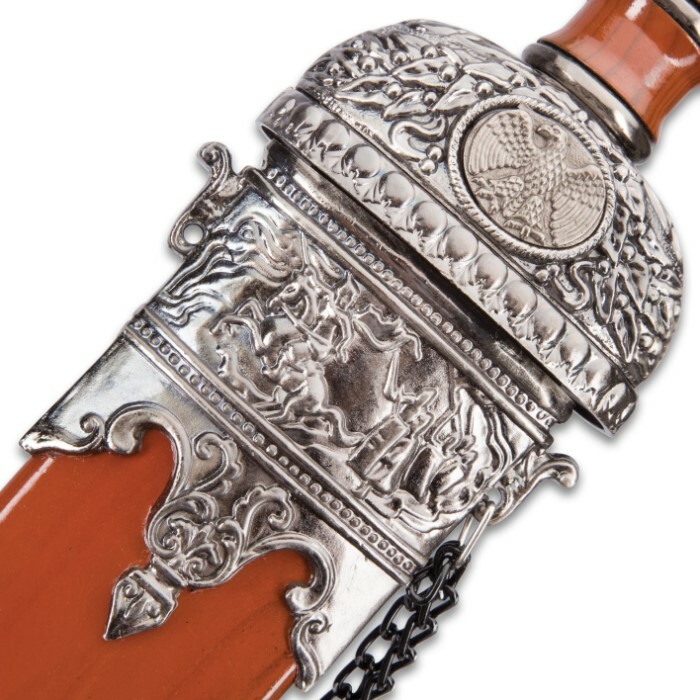 This scabbard looked just like the picture. It was blunt all the way around, but now I can take it in for show and tell before I put the edge on it. I have a washing machine motor hooked up with a huge round oil stone on it for swords and machetes, so it will be no issue. Mixed with a metal file an edge will be here shortly. My issue was when the pummel was put on it was miss aligned. There is a decent gap on one side and an overlap on the other. Another metal file job, some j.b weld on the other and a little pewter colored model touch up paint and we are happy. It cost 40 bucks you get what you pay for. Don't hate, get to work and do what you want to it. I always want to be able to get one jab in case of S.H.T.F.. Remember its a poker not a hacker hence the tip. With this metal it might bend if you whack something. I rate this as a novelty. Enjoy it for what it is. The sword came today I LOVE IT. I also got a Celtic Dagger & a william Wallace sword. The sheath on the wallace sword is nott the best but will sell it self. The dagger is great , it will bring top dollar when it sell's. The Gladius Sword is a good product, well made for the price paid. Expected the blades to be a bit sharper - perhaps its only for costume wear. 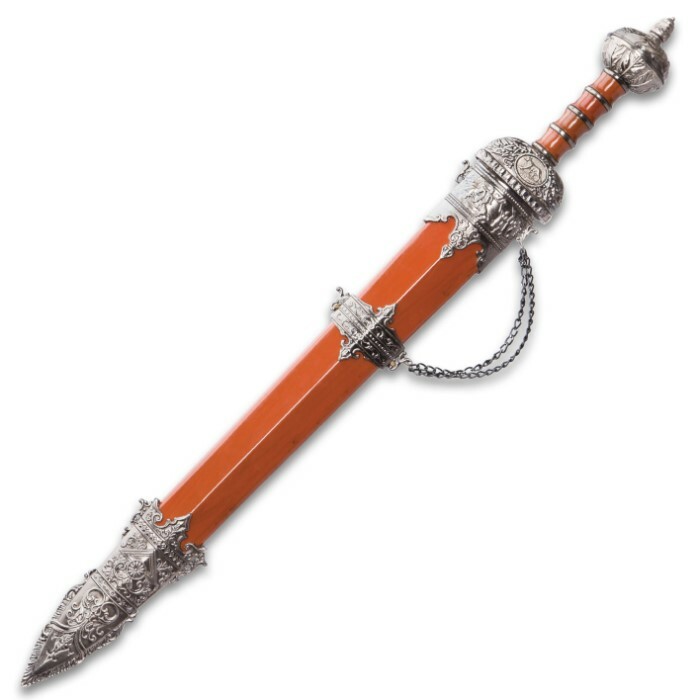 I was a bit disappointed that the scabbard is yellow/orange color. Expected it to be brown as is shown in the advertisement.